How was the discovery of the treasure made? 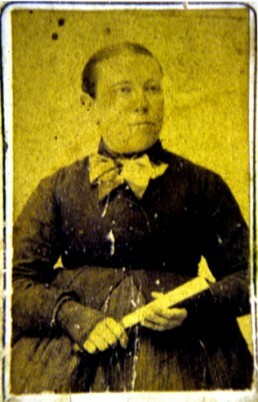 Portrait of Simona Morales, discoverersʼ daughter between 1860 and 1870. According to the statements made by the discoverers, Francisco Morales and María Pérez, the discovery was by chance on the 25th of August 1858, when they were on their way to Toledo, as they passed through the location of the Guarrazar spring. Then, they saw a shiny object among the slabs uncovered by the torrential rains of a great storm the day before. The treasure that they found, consisted of a set of gold votive crowns, precious stones, pearls, nacre, glass, etc., besides crosses, goblets, and other objects also made of gold and gems that were hidden inside a mortar chest whose dimensions were 70 x 70 cms and more than a metre deep. Next to the main treasure, another one of less importance was found by a gardener, Domingo de la Cruz, who owned an orchard near Guarrazar spring and that had seen the couple to dig up the treasure at night. As news of discovery of the treasure spread, many searches of potentially missing pieces were carried out intensely. Judging by the number of pieces handed over by Guadamur residents, it seems that these searches were successful. However, according to the poor state of the necropolis where the treasure was located, described by José Amador de los Ríos, it is clear that there was a significant loss of archaeological heritage. 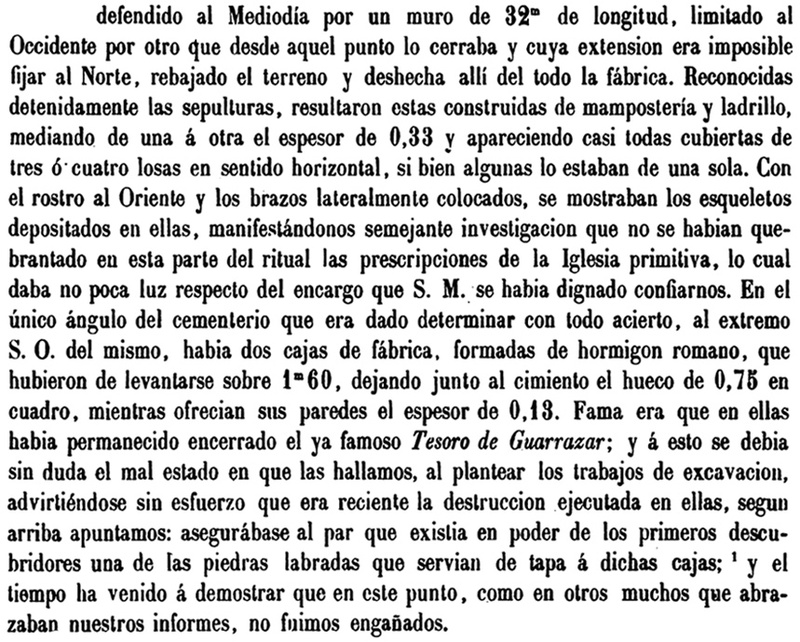 José Amador de los Ríos, responsible of site documentation, described in 1859 how he found the necropolis where the treasure was located. Early in 1859, the pieces found by Francisco Morales were sold to the French Government following several clandestine sells to different jewellers. 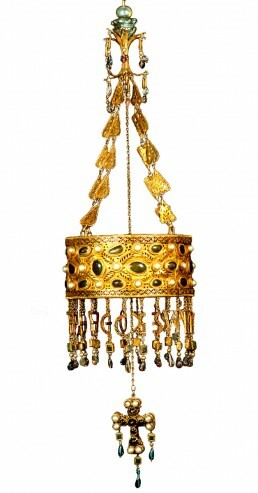 It was exhibited in the National Museum of the Middle Ages in Paris until, in 1941, as a result of an artworks exchange with Spain, six of the nine crowns are currently in the National Archaeological Museum in Madrid. 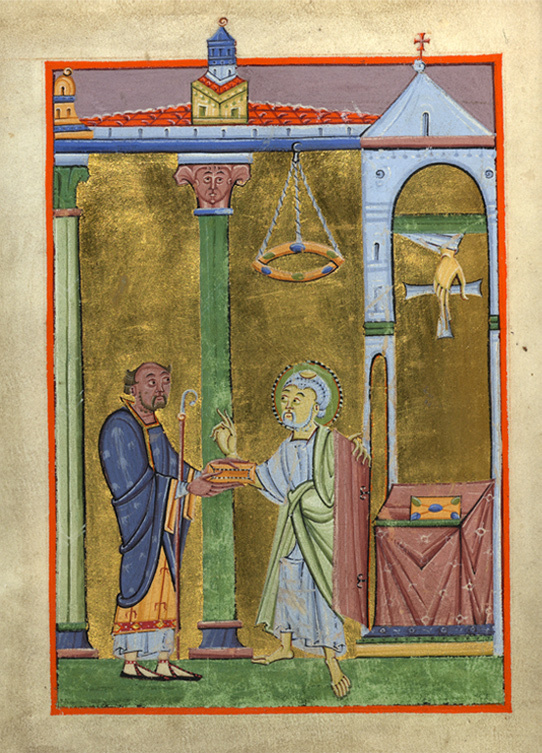 The Domingos de la Cruz hid the second set of treasure for more than two years. During that time, they came to dismantle it and sell more than three-quarters of pieces. Finally, in 1861, they handed the few remaining pieces over to Queen Isabel II of Spain; among them, the crown offered by King Suintila, which was unfortunately stolen in 1921 and since then its whereabouts remains a mystery. 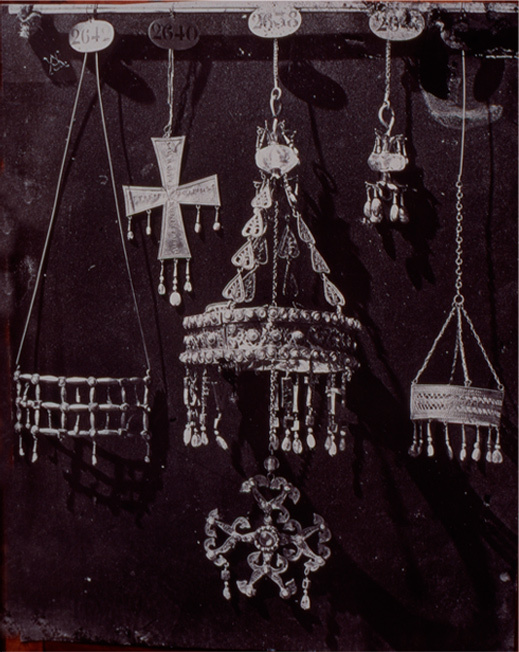 Picture of pieces donated by Domingo de la Cruz to Queen Isabel II of Spain in late XIX century. 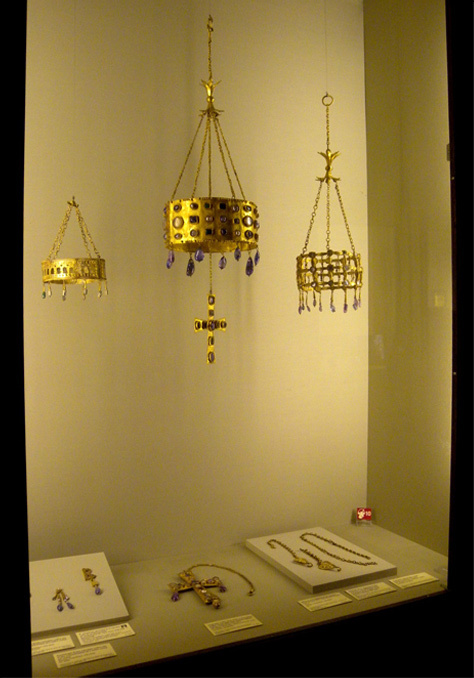 Showcase at National Middle Ages Museum in Cluny (Paris), where parts of Treasure of Guarrazar are still preserved. Although only ten crowns have been preserved, it has been estimated that twenty three of them were found. 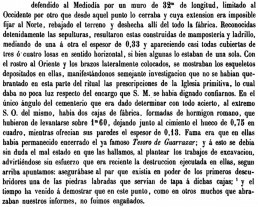 Most of the missing ones belonged to Domingo de la Cruzʼs set and it seems that among them there was one of similar characteristics to Swinthilaʼs and Recceswinthʼs, hence the assumption that it might well have belonged to another king. Apart from crowns and their respective crosses, some goblets were also included into the treasure, at least one processional cross made of gold-embossed set with gems, pearls and nacre, as well as other objects lost in sells to jewellers, the reason why we do not know what they looked like, although according to discoverersʼ statements, there was a girdle, a dove, etc., made of gold too. Despite the assumed importance of the treasure, it was not scientifically studied until 1995. The research involved a multi-disciplinary team from Belgium, Spain and France, steered and coordinated by CSIC (The Spanish National Research Council). Among the interesting results achieved, we can understand aspects related to the composition of metals and their processing techniques, as well as gemstone origins; so, we know sapphires come from the Sri Lanka (old Ceylon) and emeralds from the Austrian Tyrol. except for the embossed crown with triangular fretwork that belongs to the Royal Palace in Madrid (Photos by A. Perea). Ecclesiastical Treasure. From Toledo or from Guarrazar? 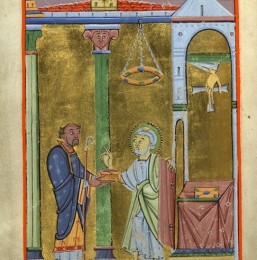 After one hundred and fifty years of debates about the origin of the treasure, whose wealth prompted historians to link it to great Toledan basilicas, recent archaeological investigations point to the hypothesis that the treasure might have belonged to a rich and influential basilica located in that area and probably called Santa María in Sorbances (name marked on a crownʼs cross donated by some Sonnica).. The rich crowns donated by kings Swinthila and Recceswinth together with a third one of similar characteristics, and therefore belonging probably to another king, raise the possibility that both the church as well as the monastery ever existed in this place, had had a close connection with the visighotic royalty. The use of crowns as a symbolical element of Kings and Emperors appears to be common of the Byzantine Empire and, although its meaning is not exactly known, it seems that the crown could represent the celestial vault, within God’s creation as a whole. 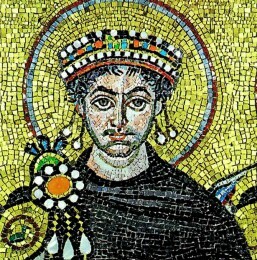 It would assign the representation of Divine Power to human being (King or Emperor) and in this sense, the image of Emperor Justitian in Basilica of San Vitale in Ravenna is of great significance, since it is not only crowned but is also depicted with a halo of sanctity. Votive crowns would have the same meaning, except that in this case, what is crowned it is the cross that represents Jesus Christ and therefore Christianity. 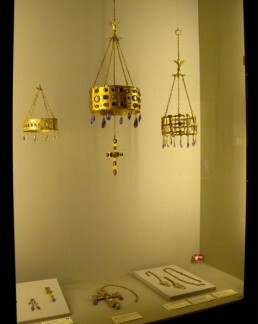 It appears that every crown from the treasure of Guarrazar had a hanging cross at the centre. 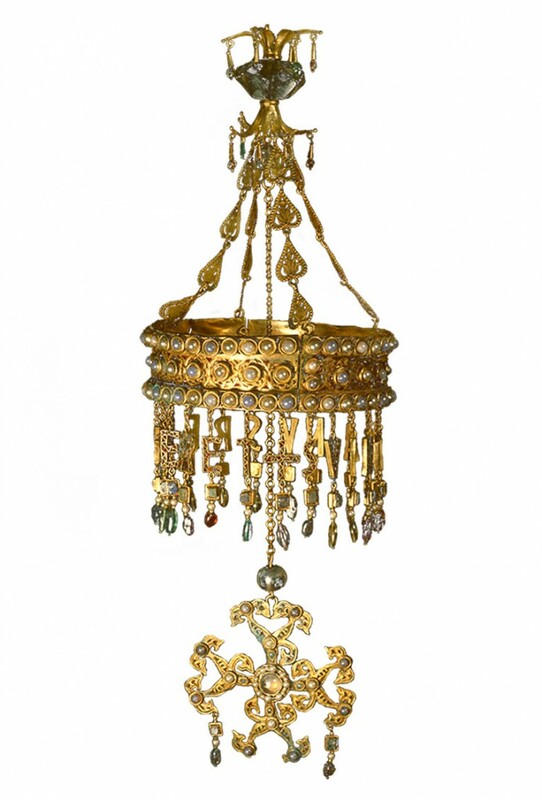 The fact that most of votive crowns had an inscription engraved with the name of the donor reveals the interest of those who brought their offerings in making it public; probably being carried out during a religious event of some relevance. 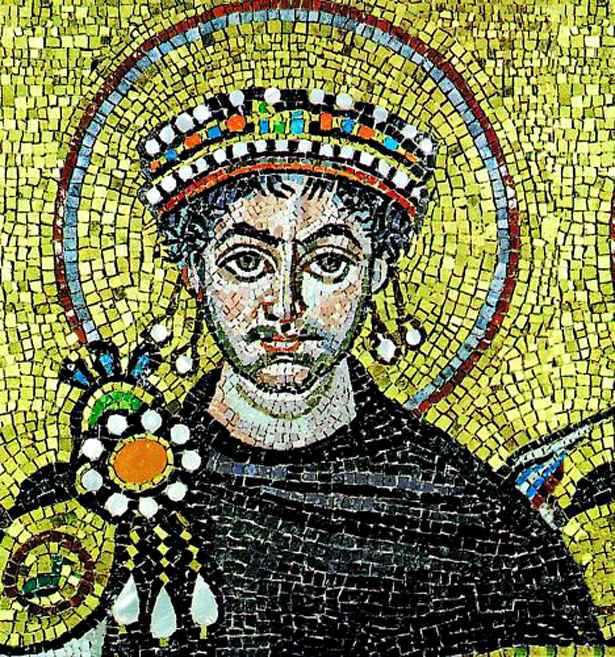 Image of Emperor Justinian in the mosaic representing the consecration deed of the Basilica of San Vitale in Ravenna, in 547. Surprising as it may seem, since José Amador de los Ríos excavated the location of the ﬁnding of treasure, nobody ofﬁcially became interested in it again, despite even many speculations put forward on treasure for more than one hundred and ﬁfty years that have passed. 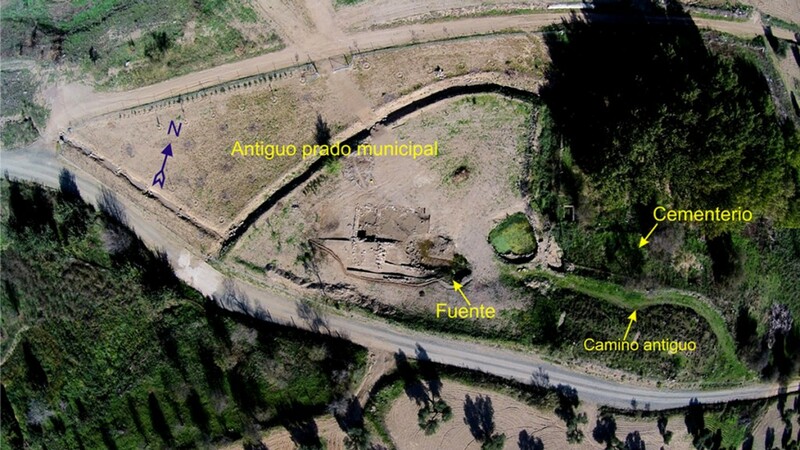 The fact that both the vegetable gardens and the practising extensive cattle were abandoned, made the place disappear, covered by weeds until, in 2014 it has been recovered through the current archaeological research project. 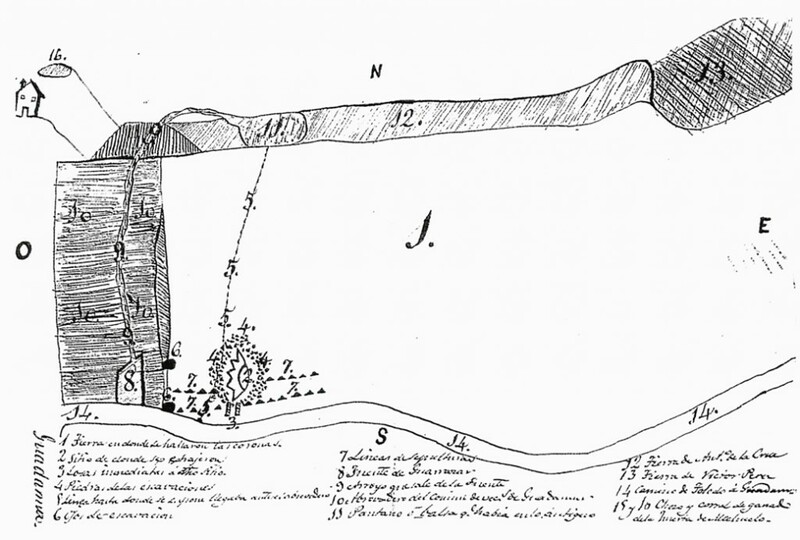 Land clearing carried out together with the description by José Amador de los Ríos and sketch completed by court order in 1859, left no room for doubt that treasure was found closer than 20 metres east of the spring. On the 8th October 2014 the discovery of a new piece of treasure took place, and curiously, it was the Mayoress of Guadamur, Sagrario Gutiérrez, the one to ﬁnd it as try to stir up the last remnants of mud from one of the sources of Guarrazar spring. . 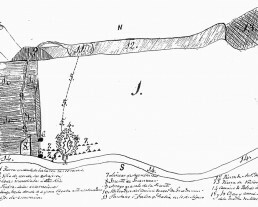 This ﬁnding provided signiﬁcant information on the place where the treasure was found, since it should be here where Francisco Morales and his family cleaned it when it was removed from its hidden place. 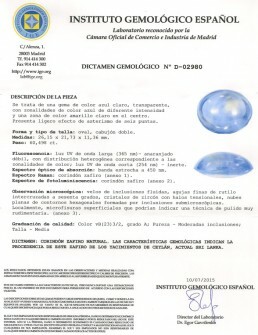 Contrary to what has happened in 1858, this last piece of treasure has been deposited in the Museum of Santa Cruz in Toledo, additionally being analysed at the Spanish Gemological Institute – IGE establishing that it is a sapphire whose characteristics place its origin in Sri Lanka (old Ceylon), like others in the treasure. Text fragment by Luis Balmaseda “Los Avatares del Tesoro de Guarrazar” (2001) -summarizing the results of statements made by Francisco Morales in the Court. 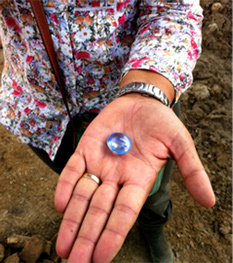 Sapphire found by Sagrario Gutiérrez, mayoress of Guadamur, in the spring. 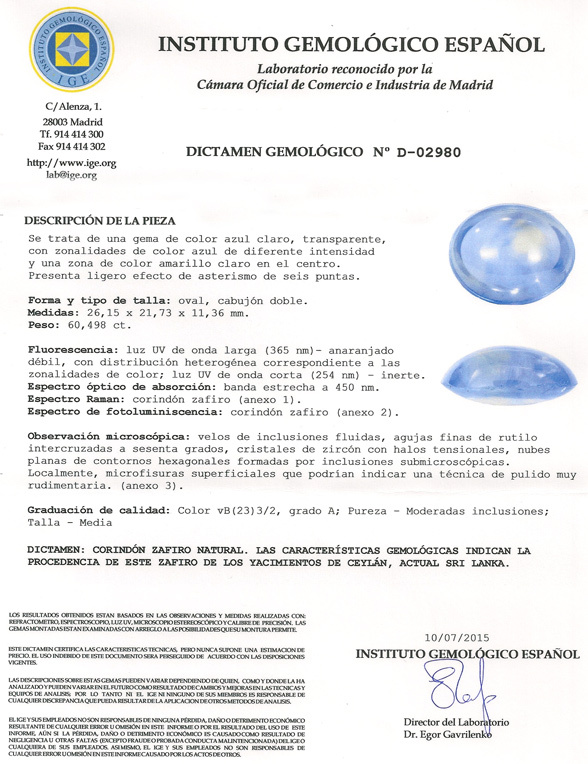 The report issued by the Spanish Gemology Institute, on the analysis of sapphire found in 2014.